According to South Korean and US officials, North Korea has fired a ballistic missile from a submarine off its east coast. 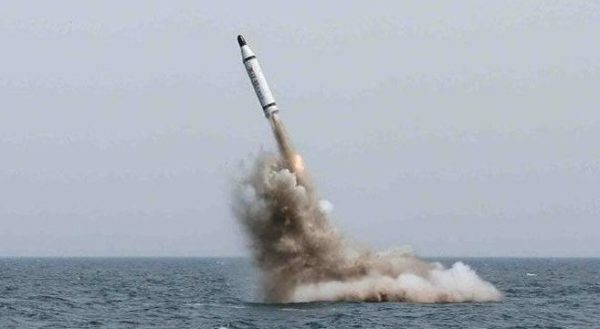 The KN-11 missile was launched from waters near Sinpo and flew about 300 miles before falling into the Sea of Japan, a US official said. Japan’s PM Shinzo Abe said it fell inside Japan’s Air Defense Identification Zone, calling it a “reckless act”. The move comes as South Korea and the US begin annual military drills, which routinely anger Pyongyang. Ulchi Freedom involves about 80,000 US and South Korean troops in a largely computer-simulated defense of South Korea from a fictional North Korean invasion. North Korea, which sees these drills as a rehearsal for invasion, recently warned they were pushing the Korean peninsula towards the brink of war and threatened a “pre-emptive nuclear strike” in retaliation. The communist country is banned by the UN from any use of ballistic or nuclear technology. But in recent months it has carried out repeated missile launches, and is believed to be close to conducting its fifth test of a nuclear device. Today’s launch appears to have been its most successful test yet of a submarine-launched ballistic missile (SLBM). SLBMs are of particular concern because of the mobility of submarines and the ease with which launch preparation can remain undetected. South Korea’s military said it “seemed to be aimed at raising military tension in response to the Seoul-Washington military drill”, the Yonhap news agency reports. It said it would “sternly and strongly respond to any provocation by North Korea”. Japan’s PM Shinzo Abe confirmed reports that the missile fell into Japan’s ADIZ, an area of airspace over which a country exercises security controls. He said it was an “unforgivable, reckless act” which “poses a grave threat to Japan’s security”. The US State Department said it “strongly condemned” this, and previous missile tests, and would raise concerns at the UN. North Korea’s launch also coincided with a meeting of foreign ministers from Japan, China and South Korea in Tokyo.